Growing up in New York City, James Bartholomew Gowen knew as a child he wanted to attend West Point. He entered the class of 1898 at the age of 21 and, being older than most of his classmates, was allowed to attend Catholic mass without parental permission. “Jimmy” participated in the war with Spain, serving in both Cuba and the Philippine Insurrection. During World War I he fought on both French and British fronts and received the Purple Heart. 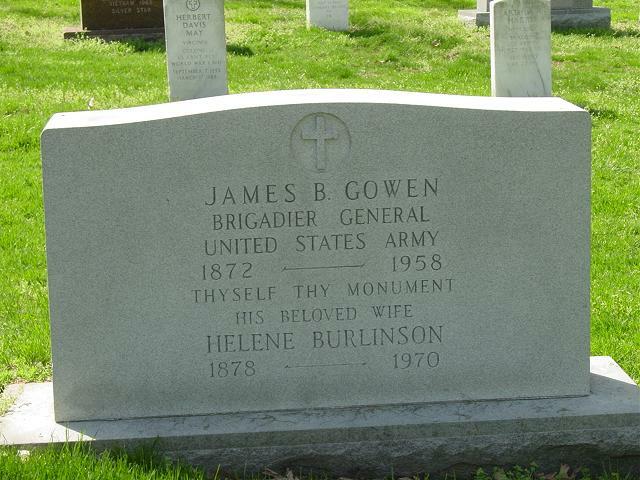 Gowen taught at and attended the Army War College and commanded the 29th Infantry from 1925 to 1927. He was promoted to Brigadier General in 1929 and was the Commanding General of the 1st and 11th Field Artillery Brigades as well as the 21st Infantry Brigade. General Gowen retired in 1936. He died on 9 August 1958 at Walter Reed Army Hospital at age 85.